Thanks to Cadillac enthusiast, Salvatore Darigo, I was able to acquire, in November 2001 an advance copy of the factory-issued press kit for the new Eldorado Brougham model. This particular kit was sent originally to the Vehicle Sales Manager of GM New Zealand, Ltd. (I don't know if any new Eldorado Broughams were sold in New Zealand as a result of this marketing effort). The official press kit distributed at the NY Salon may not have included precisely the same press photos nor the same number of them. There were around seven of them in each portfolio; those I have encountered are shown below. 20 East 42nd Street, New York 12, N.Y. The bulk of press photos taken just before the NY Auto Show featured production car #3. The photo shoot took place in New York's Central Park, near the Tavern on the Green. The car was featured also in some film footage. Eight typical publicity shots are shown below. and an air suspension system which maintains the car at a constant height regardless of load or road conditions. 1. The Brougham has an air suspension system which replaces metal springs. 2. There is a leveling system which works in conjunction with the suspension system. 3. The Brougham is powered by a 325 horsepower high performance engine with twin four-barrel carburetors. The compression ration is 10 to 1. 4. There are three sea shell horns and one trumpet horn which work simultaneously. 5. In addition to the front speaker, the pre-selector radio has a rear speaker on the top center of the rear seat back. The antenna, when the radio and ignition switches are "ON", automatically rises to roof height for city reception. An over-ride switch allows it to be raised to its full height for country reception. 6. With the ignition "ON" the engine automatically starts when the Hydra-Matic gear selector is moved to "Neutral" or "Park". 7. All doors are safety latched into a locking mechanism which stands 14 inches above the floor. Also, the rear doors are automatically locked to this pillar when the car is in any drive gear. 8. All doors can be locked by controls in the front compartment. 9. The trunk lid can be unlocked, opened, closed and locked by a master switch in the glove compartment. 11. Anti-dive control built into the spherical joint front suspension which restrains the front of the car from diving when the brakes are applied. 12. The rear suspension has a new high-roll center four-link type suspension between the frame and rear axle which minimizes shake or roll and provides better control on rough roads. 13. The Brougham has a tubular center X-frame which utilizes outrigger body mountings without side rails to permit a lower floor pan and increase torsional strength. 14. Axle ratio will be 3.36 to 1. 1. The Brougham has its own customized body, built exclusively for this car. 2. The over-all height is 55½ inches and the over-all length is 216 inches. 3. The car features a stainless steel roof. 4. Center posts are eliminated. 5. The extra large compound curved windshield has a low angle. Tinted glass is used in the rear window. 6. Has new deep fluted wheels of forged aluminum. 7. The tires are 8.40 x 15 but in cross-section are more oval than round. Also the tires have 1 inch white sidewalls. 8. The hood and rear deck are below the fender lines. 9. A very pronounced cowl air intake with greater fresh air capacity. 10. The tail fin houses a tail light in its trailing edge. 11. The rear wheel openings do not have skirts but are surrounded by a section of stainless steel which extends from the center of the rear door to the wrap-around rear bumper. 12. The rear bumper is made of three functional sections which are flush to the body. 13. The outer sections of the bumper house the back-up light, turn signal and stop light and at the outside the vertical exhaust port with its four horizontal louvers. 14. The center bumper section houses the plastic cover for the license plate. 15. 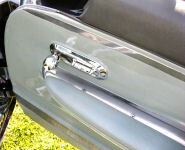 There is a chrome strip or molding which runs on each side from the two headlamps back to the center of the rear door. 16. There is no hood ornament other than the Cadillac V and the name Eldorado. 17. A true four headlamp system pioneered by Cadillac is used. The outer amps feature a greatly improved low beam and a high beam which gives soft general lighting. These are recommended for city use. In the country the inner lamps which are bright, accurately aimed distance beams are used in conjunction with the outer lamps. 18. An inverted gull-wing bumper with rubber tipped bumper guards surround a cellular grille. 19. Centered below each two headlamps is a sound wave opening for the horn. 20. Both front and rear doors open away from the center of the car, resulting in easy entrance and exit to the rear seat. 21. The front fenders and cross-over panel above the grille are all in one piece. 22.The forward hinged hood is connected to the cross-over panel. 23. There is a crest with "Eldorado Brougham by Cadillac" in script on the rear section of each front fender. 24. There are 15 distinctive exterior colors for the Brougham. All are acrylic paint which holds the luster of the finish. 1. The new instrument panel has an extra wide glove box with the lock located left of center for driver accessibility and a new instrument cluster. The door of the glove box will be custom fitted with a cigarette case, tissue dispenser, vanity compact [made by Evans, USA] and lipstick, stick cologne [in fact, though often listed, the latter item was never included among the Brougham vanity/personal accessories], four metal magnetized gold-finish drinking cups [in actual fact there were six and these had a chrome finish - not gold] and a full length metal-back acrylic vanity mirror that folds outward forming a horizontal metal shelf [a convenient tray for resting the magnetized tumblers]. The box will be illuminated by two recessed lights. 2. A three-passenger front seat with a center arm rest. 3. A two-passenger rear seat [that will accommodate three, just like the front seat] with a center arm rest over the propeller shaft tunnel that conceals a small storage compartment containing a note pad and pencil, portable vanity mirror and a perfume atomizer complete with Arpège, Extrait de Lanvin. 4. New hardware, hang-on panels, steering wheel, steering column covers and fabrics. 5. New trim styles and colors including choice of genuine mouton ["mouton" is French for "sheep"] or high pile nylon Karakul carpets [the Karakul carpets were intended to imitate the tightly-knit wool of the Karakul lamb, a hardy breed from the village of Bukhara in Uzbekistan]. A total of 45 standard trim and color options will be available [in fact only 44 combinations are listed, as well as an unspecified "special combination by request" - 14 cars out of 704 built got such a special combination]. Two special order trim styles will be made available at extra cost [I don't believe that any extra cost was charged for options on the Brougham]. 6. A six-way front seat that will automatically move to aid passenger entrance and exit. The front seat moves to the best position (down and back) for front passenger entrance or exit when a front door is opened. When all doors arc closed and the driver is in position the seat returns to the position indicated by the new "Favorite Position" dial controller located in the left front arm rest. 7. A new front heating system ad two rear under seat heaters. These rear under seat heaters can be operated individually by rear seat passengers. 8. Air conditioning is standard equipment. 9. Instrument panel is newly designed. Fuel level, water temperature, oil gauge and a new ammeter have a 270 degree sweep hand. In addition, tell tale lights are used to indicate low oil and air [suspension ???] pressure, battery discharge, low fuel warning and high radiator temperature warning. 10. Radio has both knob controls on the left with speakers in front and rear. 11. Drum clock which facilitates reading. DETROIT -- The Cadillac Eldorado Brougham, an all new five-passenger super luxury sedan now in limited production, is a car that looks ahead, according to James M. Roche, Cadillac General Manager and Vice President of General Motors. "The word 'first' has been synonymous with Cadillac since its beginning in 1902", Mr. Roche said, "and the Brougham, with completely new styling and numerous engineering features never before incorporated in any car, marks one of the most important 'firsts' in automobile history." Two years of concentrated test and development preceded today's announcement of the Brougham (rhymes with home). Its styling and engineering features are the result of many years of research by Cadillac and General Motors stylists and engineers. Completely modern in every detail, the grace and sleekness of the Brougham is accented by its pillarless four-door styling, an extremely low over-all height of 55.5 inches and a roof of brushed stainless steel. Among the outstanding engineering features which exemplify the extensive study that went into the makeup of the Brougham are air suspension, a four headlamp system and a tubular center X-frame. The use of air springs marks the first time that such a system has been used on an automobile. The system provides an individual air spring unit at each wheel. Air is supplied to the spring units through leveling valves so that the car remains level with varying loads and road conditions, thus contributing to the Brougham's appearance as well as assuring consistently easy handling and smooth riding quality. Anti-dive control built into the spherical joint front suspension restrains the front of the car from diving when the brakes are applied. The rear suspension has a new high-roll center four-link type suspension between the frame and the rear axle which minimizes shake or roll and provides better control on rough roads. Outer lamps -- The outer lamps, with both high and low beams, are for city driving. On low beam there is greater wattage than with present day low beam which results in greatly improved illumination. The high beam gives a soft general lighting. Inner lamps -- The inner lamps have one beam, a bright spotlight effect that is accurately aimed. These inner lamps are used along with the high beam of the outer lamps for country driving.The combined wattage of these four lamps is much greater than the high beams of two lamp systems which means that the driver has much better illumination. Additionally the light is directed so that the driver gets maximum vision without creating a glare in the eyes of oncoming traffic. A rigid, tubular center X-frame permits lowering the floor and car while increasing torsional rigidity. The body is secured to outrigger mountings in contrast to former years when the body was secured to side rails. Basically, the frame includes a tubular backbone from which arm-like beams V-out forward and rearward. The outrigger mountings or brackets extend out from the box-type beams. Built on a 126-inch wheelbase, the Brougham is 216 inches long and 78½ inches wide. Tread front and rear is 61 inches. Powering the Brougham will be a 325 horsepower high performance Cadillac engine with twin four-barrel carburetors, a special air cleaner and a special intake manifold. This V-type overhead valve engine has a 10 to 1 compression ratio, a four inch bore and a displacement of 465 cubic inches. Improved efficiency results from better combustion which is achieved by a larger diameter combustion chamber. Completing the power train will be a new and improved Hydra-Matic Transmission. The clean front end lines of the Brougham are complemented by the smooth contour of the lower and flatter hood design. A curved cellular grille is nestled between projectile shaped gull-wing bumpers beneath which are located recessed rectangular fog lamps. As a safety measure, the tips of the bumpers contain rubber inserts. The deep dish, forged aluminum wheels of the Brougham are mounted with low profile high speed rating, premium quality tires distinguished by a one-inch wide, white stripe. A sharply defined molding flows rearward from the forward edge of the front fender to the louvered vertical molding in the center of the rear door panel, creating a sculptured effect. Dramatically styled rear quarter panels feature swept back tail fin styling with delicately formed stainless steel fender skirts extending from the vertical molding to the rear bumper section. The rocker sill also is trimmed with a stainless steel molding. Protective chrome rear bumper pieces in three sections are mounted flush with the body and are integrated with the structural members of the chassis. The outer bumper pieces form housings for the dual oval exhaust ports beneath each tail fin and contain back-up lights and combination directional-stop signals. The inner section is recessed and houses the license plate. Highly visable [visible???] tail lights are built into the vertical trailing edges of the tail fin. 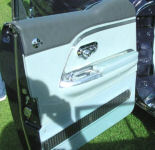 The Brougham has locking plates, 14 inches from the floor, which provide latching points for the rotary safety door locks. This mechanism replaces the conventional center side pillar which is eliminated. When the ignition is on, a switch incorporated in each rear door prevents shifting the transmission selector lever into a driving position if either of the rear doors is open. All doors can be locked by controls in the front compartment. The Brougham has an ingenious front seat mechanism. The driver pre-selects the seat adjustment best suited to himself by a means of a new "Favorite Position" dial control located in the left front arm rest. When he opens the front door, the seat automatically moves down and back for easy entrance or exit. When all doors are closed and the driver is in position, the seat will return to the position indicated on the "Favorite Position" controls. The interior of the Brougham is luxurious to a high degree with some 45 choices of trim and color combinations with two additional special-order trims available [in fact 44 combinations are listed, as well as an unspecified "special combination by request" - 14 cars out of 704 built got such a special combination]. carpeting is available in either mouton, a specially processed lamb skin ["mouton" is French for "sheep"], or high-pile nylon Karakul [imitating the tightly-knit wool of the Karakul lamb, a hardy breed from the village of Bukhara in Uzbekistan]. There are wide center am rests front and rear. The rear armrest contains a small compartment with such conveniences as a note pad and pencil, portable vanity mirror and a perfume bottle atomizer containing Arpège, Extrait de Lanvin. Fashioned with jeweler's precision, the instrument panel has an extra wide glove compartment with the lock located left of center for easier driver accessibility. The inside of the glove compartment is custom fitted with such personal accessories as a cigarette case, tissue dispenser, vanity compact [made by Evans, USA] and lipstick, stick cologne [in fact the latter was never included among the Brougham vanity items] four metal magnetized gold-finish drinking cups [in actual fact, there were six and these had a chrome finish - not gold] and a full length metal-back acrylic vanity mirror which folds out to form a horizontal metal shelf [a convenient tray for resting the magnetized tumblers]. The glove compartment is illuminated by two recessed lights. Cadillac engineers have thought of everything for the Brougham. For example, when the ignition switch is "ON" the Brougham engine is started by placing the transmission selector lever in either "Neutral" or "Park" positions. There is a special heating system with both front and rear compartment outlets. The under-seat heaters for the rear can be operated individually by the passengers. To complete the year-round comfort, each Brougham contains a front-mounted Cadillac air conditioner that provides 100 per cent cool fresh air. Also new is the all-transistor radio and an antenna which rises automatically to urban eight when the ignition and radio are "ON" and automatically recedes when the radio or ignition are turned "OFF". An overriding button permits raising the antenna to its full height to secure maximum range in country driving. Steering, braking and window controls (including ventipanes) are power operated on the Brougham. As a final touch of convenient motoring, trunk lid operating controls, which are located in the glove compartment, unlock, raise, then lower and lock the trunk all without the driver leaving the car. The Eldorado Brougham is an automotive dream which has become a reality. The Brougham embodies the greatest number of styling features of any car on the road today. This four-door, five-passenger sedan is 55½ inches high and 216 inches long. From its rubber tipped bumper guards, along its lowered hood and fenders, past the big compound curved windshield and brushed stainless steel roof with its tinted rear window to its spacious trunk, individualistic rear fins and three-piece rear bumper the Brougham is completely new. The car is equipped with a true four headlamp system, development of which was pioneered by Cadillac. These lights help frame a newly designed cellular grille and inverted gull wing bumper, which houses a parking light at each extremity. The wheel openings are new and attractively display a one-inch white side wall strip on the tires which in cross section are more oval in shape. The specially designed 15-inch wheels are of forged aluminum. The fenders are made of one piece which is continuous across the front of the car above the grille. It is to this crossover panel that the forward hinged hood is attached. The extra large windshield is of compound curved E-Z eye glass with a longer slant to offer the best visibility possible. The wide angle rear window is also of tinted glass and use of a specially constructed rear view mirror allows excellent viewing. Stainless steel which is not only strong and durable, but also appealing to the eye, is used to great advantage on the Brougham. The top is of brushed stainless steel which crowns the distinctive styling. Stainless also is used for moldings and as the section surrounding the wheel openings in the rear quarter panels. The distinctive treatment of the rear section features redesigned Cadillac fins with a vertical stop light in the trailing edge of each fin. The outer sections of the functional three-piece bumper houses [house] the exhaust posts which are outboard and have four horizontal louvers across the port, the centered tail lights and directional signals and the inboard back-up lights. The center section of the bumper is the plastic covered license plate holder. Inside also the Brougham is completely individualistic. There are over 45 interior combinations including rugs of mouton [i.e. sheepskin] or deep pile Karakul [wool]. A choice of any of 15 deep luster, long life Acrylic colors is available in exterior paint. A neat, compact dash with all the controls placed for easy driver accessibility features warning lights for low oil pressure, low fuel, high temperature and battery discharge. Even the radio and glove compartment controls are placed to the left for driver convenience and safety. Installed in the dash is a drum type clock which can be read quickly and easily. Cadillac's Eldorado Brougham is truly designed for driver and passenger comfort, convenience and safety through power operated features. The 325 horsepower Cadillac engine will furnish immediate power when needed. The trunk can be opened and closed without the driver leaving his seat. There are power brakes, power steering and a six-way power seat [no mention of "Memory Seat" option?!?!]. All opening windows are powerized, even the vent windows. A pre-selector radio, air conditioning and heater are all standard along with tinted glass. Noticeably absent in this text is any reference to the exclusive, new front "Memory Seat" and the equally appealing vanity items delivered with each Brougham. The Eldorado Brougham -- designed in 1954 as Cadillac's dream car for the General Motors Motorama of 1955 -- has been brought into automotive reality through the closest kind of teamwork among engineers, designers, research experts and other car craftsmen. James M. Roche, Cadillac General Manager, points out that the two years of concentrated testing and development which immediately preceded the announcement of the Brougham as a limited production car "were merely the climax of long years of research and experimentation by our engineers and designers in their continuous search for a better way to build the best automobile". "Our goal was to build the finest car possible", Mr. Roche said, "and the experiment has been a success. The Brougham has been proven in tests in our engineering laboratories, at our Proving Grounds, on the highways of America and before the discerning eye of the automobile public from coast to coast. We feel that it represents achievement of the goal we set out to attain -- and more". A year ago, GM President Harlow H. Curtice told a U.S. Senate Sub-Committee and the world that one of the key factors in the success of General Motors is the "attitude of the inquiring mind" which characterizes the company and all its divisions. The Eldorado Brougham is the direct result of the "inquiring minds" of Cadillac stylists and engineers. In their search for "a better way" to incorporate new standards of quality, engineering, design, safety and performance into an automobile, they built the Brougham. After pioneering the concept of the Brougham, Cadillac stylists and engineers called upon the vast technological resources of the research, styling and engineering staffs at the GM Technical Center. The facilities and technical know-how of these staffs were placed at the disposal of the Cadillac technicians to help in developing this all-new automobile. After the car reached dream car stage [1954-55] and was shown throughout the nation, the GM research department learned from the public that the Brougham was exceptionally popular with the spectators. After showings in New York, Miami and Los Angeles, the Brougham "snowball" was at full speed. By the time it reached San Francisco in March of 1955, Cadillac's confidence in the car was supported by Customer Research reports so it was announced from the West Coast city that Cadillac would build the Brougham as an exclusive, limited production luxury car. From the beginning, the Brougham was a pace-setting vehicle with styling and engineering features destined to be incorporated into lesser cars in future years. It is that kind of an automobile. Cadillac engineers came up with a special body for the Brougham alone. It was built by Fisher Body's Fleetwood plant, builders of all Cadillac bodies. Its unique stainless steel top -- another Cadillac first -- already has caused widespread comment throughout the industry. Cadillac and Fleetwood engineers teamed up to mount [surmount ???] many obstacles in order that the Brougham might be built with this top. 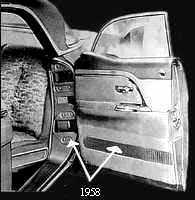 The Brougham has true air suspension -- where air replaces steel springs -- the first time this method ever has appeared on any passenger car anywhere. The "inquiring mind" of Cadillac engineers sought a new and better way to cushion the ride for Cadillac passengers. Teaming up with GM Technical Center engineers and others, they found it in air suspension, a feature which, it seems certain, will be adopted in the future by the rest of the industry [unfortunately, owing to the many problems owners encountered with this system, it was never the success that Cadillac had estimated it would be]. The four headlamp system was pioneered on the original Brougham dream car in 1954 and its appearance on the new, customized Brougham will mark the first time the actual Brougham system has reached the highways of America. Each feature of the Brougham -- as the car itself -- is designed to improve comfort, safety and convenience for the driver and passengers. Through the "inquiring minds" of Cadillac engineers and designers has come the finest car possible for Cadillac to build. While the features of this automobile will be available only on the Brougham, the pace will have been set and it seems inevitable that they will become Cadillac "firsts" and be adopted on an industry-wide basis, as has happened so often in the past [unfortunately, in this instance, Cadillac's expectancy did not materialize]. A suspension system in which air springs replace steel springs is one of many outstanding engineering developments in the Cadillac Eldorado Brougham. In this system -- the first true air suspension for any automobile -- the Brougham actually rides on four air springs, one at each wheel, which maintain the car at a constant level, as well as smooth out rough roads. It does these things regardless of the car loading and road conditions. These air springs replace the conventional steel coil springs in the front and the semi-elliptic leaf springs in the rear. Development of the system stems from the principle that air is a compressible, easily controlled medium with outstanding dampening qualities. When controlled as in this Cadillac system the air does not transmit road harshness or vibrations. -- road to roof top -- regardless of car loading. Because of the constant height characteristics and variable rate characteristics, it is possible to soften the spring rate with the resultant better ride. The major components of both front and rear assemblies are the dome, rubber diaphragm, retaining plate and piston. The bullet like piston and tough rubber diaphragm fit into the carefully shaped dome which is secured to the frame. It is the air in the dome, acting on the rubber diaphragm which serves as the spring between the two. These valves (one at each rear air spring and one for the front springs which serves both by means of a check valve) are the "brains" of the system. They control the car height by controlling the flow of air to each individual spring. The control solenoid package consists of two pairs of valves. One pair of valves is known as the "lockout solenoid". Its function is to act as a lockout to the air lines for parking, wheel changing, or for preventing the operation of the leveling system for any reason. The other pair of valves act as a "restriction solenoid'. Its function is to give fast or slow leveling by controlling the air flow to and from the air springs. For example, rapid leveling is desired when loading of the car is being changed. On the other hand, restricted leveling is desired when the car is in motion to assure a constantly smooth ride. The compressor, powered by an integral electric motor, provides the air for the system. A pressure limit switch starts and stops the compressor to maintain air pressure of 100 to 120 pounds per square inch in the accumulator or air storage reservoir. The compressor is mounted on top of the generator while the accumulator is located just forward of the radiator on the radiator support. These basic air suspension components along with the obvious air lines combine to give Cadillac's new Eldorado Brougham the smoothest and most constantly level ride ever known to a passenger car. Bore and Stroke 4" x 3.625"
Piston Travel per car mile 1.497 ft.
Oil Capacity (with filter) 6 qts. Cooling Capacity (with heater) 22.6 qts. Turning Dia. (curb to curb) 42 ft. Effective Brake Lining Area 219.32 sq. in. Factory production records of the Eldorado Brougham models appear to be very detailed and accurate. So far as I have been able to determine, all the 1957 production cars were delivered to customers (or to the factory), that is from body # 1 through body # 400. 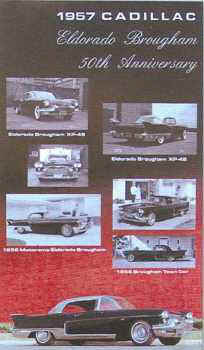 The first production Broughams began to be shipped to selected dealers only on March 11, 1957. Shipment was officially announced to those dealers on 18 March, 1957; the customer list price was set at an "astronomical" $13,074. - electrically operated vent window panes were added. - the chrome edge-moldings around the front wheel openings. - there were minor design differences on the dash panel [the prototype Broughams had dummy instrumentation]. Cadillac's Eldorado Brougham, the first American car to use a true air suspension system, has finally reached production reality. 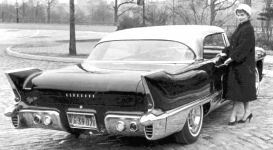 The super-luxurious four-door hardtop made its debut at the National Automobile Show in New York [January 1957]. Public introductions will be held in key cities throughout the United States after February 1. Although it contains several industry "firsts", the Brougham does not have several of the features expected. It uses conventional carburetors rather than fuel injection, for example. The decision to stick with carburetors was a last-minute one. Cadillac engineers have been working frantically to ready an injection system, but were not fully satisfied with test results. It would not be surprising to see Cadillac make a running changeover to fuel injection later in the year, however. Only 55½ inches high at the top of its stainless steel roof, the Brougham has a 126-inch wheel base and is 216 inches long overall. This makes it a compact car by Cadillac standards. (It has a shorter wheel base and is narrower, but about the same overall length, as current 62 series models). The 325-hp engine is the same one used by other 1957 Eldorado models. It uses two four-barrel carburetors, displaces 365 cubic inches and has a 10-to-1 compression ratio. 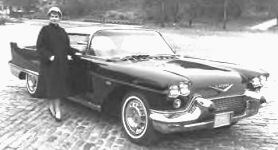 The Brougham's frame is similar to the one used by other 1957 Cadillacs. It has a tubular backbone and is shaped roughly like a big "X". The air suspension system features air spring units at each wheel. Air is supplied to the spring units thru leveling valves so the car remains level with varying loads and road conditions. This contributes to easy handling and exceptionally smooth riding qualities. Anti-dive characteristics are built into the ball-joint front end to keep the Brougham from nosing down during fast stops. The Brougham has a four headlamp lighting system like that pioneered by its original prototype, the 1955 GM Motorama show car. This system uses outer lamps with both high and low beams; these lamps are for city driving. Low beam has more wattage than standard single lamps. Thus, improved low beam illumination is provided. High beam of the outer lamps gives a soft, general lighting. Inner lamps have a high beam only; actually, they furnish a kind of spotlight effect. They are used along with high beam of the outer lamps for highway and country driving. Combined wattage of these four lamps is much greater than two-lamp systems and furnishes better illumination. In addition, the light is so directed that a driver gets maximum vision without creating a glare to blind drivers of oncoming cars. The Brougham's power train is similar to standard Cadillacs. The Hydra-Matic transmission is mounted conventionally right behind the engine. There are no center pillars in the Brougham. Instead, locking plates, 14 inches from the floor, provide latching points for rotary-type door locks. Gadget lovers will have a field day with this new Cadillac. Just about everything that can be power-operated is! This includes seats, all windows (including vents), trunk lid, etc. Power steering, power brakes and air conditioning are standard equipment. There are special heaters for both front and rear seats and Broughams all will have all-transistorized radios. (Radio antennas are power-operated - naturally - and rise automatically to "city height" when the radio is turned on. They can be raised to full height for maximum range by means of an overriding switch for country driving. The antennas automatically retract into fender wells when radio or ignition is turned off! Brougham styling shows its Cadillac relationship very clearly. Such typical identification features as the grille and rear fenders are retained. An interesting construction note, however, is the one-piece front end. Fenders are made of one piece which is continuous across the front of the car above the grille. It is to this crossover panel that the forward-hinged hood is attached. The huge compound curved windshield rakes back sharply to the roof line. Both windshield and backlight are made of tinted E-Z Eye glass to cut glare. The price tag for the Brougham had not been announced at the time this report was written. However, it very likely will exceed $10'000. And, even at these unusual figures, Cadillac undoubtedly will be able to sell all it can make, and will no doubt give Continental a rough time for "Prestige Car" honors in 1957. There were few changes between the 1957 and 1958 production Eldorado Brougham models and it takes an expert eye to distinguish between them. The easiest way to distinguish between the 1957 and 1958 models is to check the Body Tag [cars #1 through #400 are 1957, and #401 through #704 are 1958]; interior trim differences on the door panels also are a giveaway. The final Eldorado Brougham was built in July, 1958. Outside estimates place the cost to Cadillac of each of these fabulous cars at around #23,000, which means that the company lost about $10,000 on each of them. But what a master stroke to have taken that risk, and what a boost for the company's image as one of the contenders for the title of "World leader in the manufacture of luxury automobiles". On the technical side, the major difference is to be found in the engine compartment. The 1957 engines have two 4-barrel carburetors, whereas the 1958 cars were fitted with three 2-barrel units. 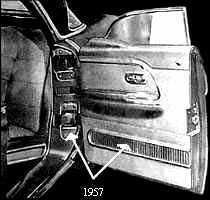 Changes were made also for 1958 to the rear axle housing, the brake master cylinder, the ignition distributor, the distributor cap, the dash wiring harness, the crankcase, the cylinder heads, certain air cleaner parts, the electric fuel pump, the hood latch, the power steering pump, the transmission, the electric window motors and the door locks. More information on the 1957-1958 Eldorado production models may be found inter alia in: H (pp. 297-301), CC 3/1978 (pp. 21-25, 44-46), 8/1985 (pp. 52-53) and 6/1985 (pp. 34-41), NIT special M1602 (pp. 54-55), SIA 11-12/70 (cover, pp. 30-35 + 54), SIA 3-4/1981 (p. 25), SIA91, MC, Fall 1974 (front cover + inside front cover + pp. 2-9 + 32-33), MC, Fall 1975 (pp. 10-15 + rear cover), SSA 30th anniversary Issue (cover and pp. 42-49), PS 8/56 and 1/57, CC&CC, 3/1978, CC&CC, 11/1988 and ML, 2/57. In MK 9/1990 (seen in HW coll. ), pp. 10-15, it is reported that a Brougham in condition "2" was sold in Switzerland for 85000 SFr. ; this was three times the fair market value of such a car in the USA at that time. No other details about that Swiss Brougham are currently available.